Sora Tasty Blogger Template is a clean look theme that’s specially designed for Magazine, Travels, Kitchens, Recipes and personal blogs. You can customize what ever you think to make your website much better from your great ideas. This is not just a normal theme, it’s a collection of amazing live blogging experience. 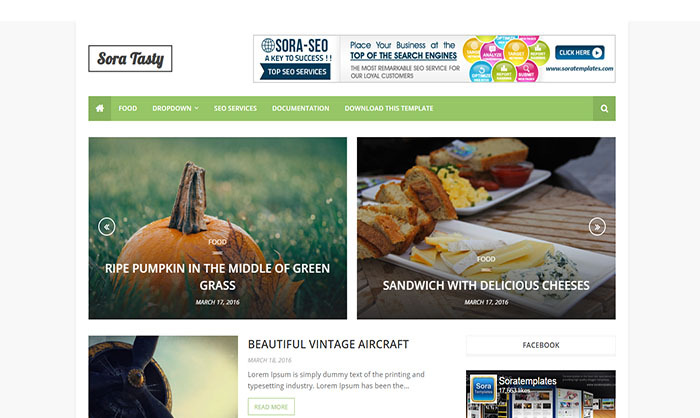 Sora Tasty is responsive and SEO friendly blogger theme optimized and displayed perfectly on any devices. It will load you website content within just minutes and make user experience more smooth.